By now you have probably heard about the Budget Blueprint for fiscal year 2018 released by the 45th White House administration that includes the elimination of the National Endowment for the Arts (NEA), and the National Endowment for the Humanities (NEH). This is what we are fighting for! We at Sones de Mexico Ensemble feel compelled to share our testimony with our stakeholders. While we are committed to prevailing against this and any other adversities, we need to explain the impact that these changes could have on our ability to carry out our mission. The National Endowment for the Arts’ FY2016 appropriation of $147.9 million, which constitutes approximately .004 percent of the federal budget, leverages 4.8 million American jobs in Arts and Culture industries and contributes $730 billion to our GDP, which is more than construction, transportation and travel & tourism. A $30,000 grant for Sones de Mexico Ensemble in FY2014 leveraged year-round work for 9 people and about $240,600 in spending on the programs you love to see. NEA funded programs are free to the public and reach audiences in geographic and economic areas otherwise underserved by the arts. Here are some examples of our programs supported by the NEA. 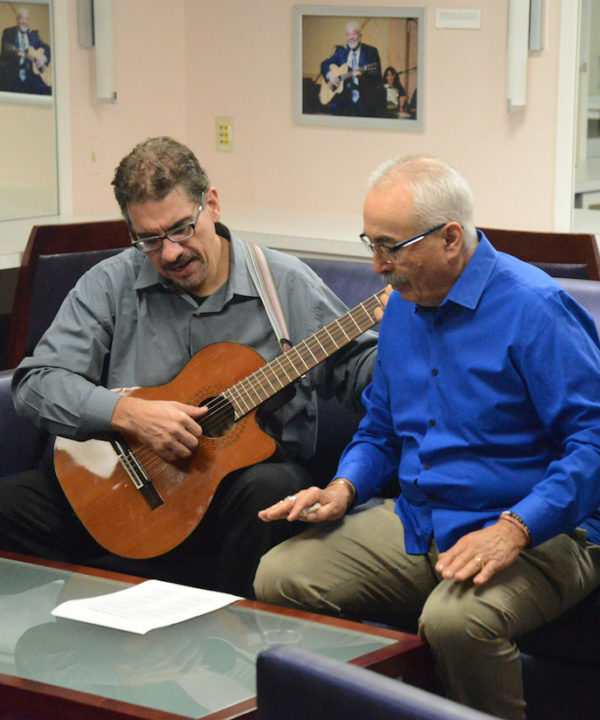 Since 2009, NEA funding has allowed Sones de Mexico Ensemble to bring dozens of free programs to 17 states, including rural and urban libraries, community centers, and senior centers. The lecture/demo series “Beyond the Music: A Musical Geography of Mexico” (over 100 nationwide performances to date) features a map, the ensemble, and over 40 musical instruments to showcase little-known gems in regional styles of folk music and dance from across Mexico. 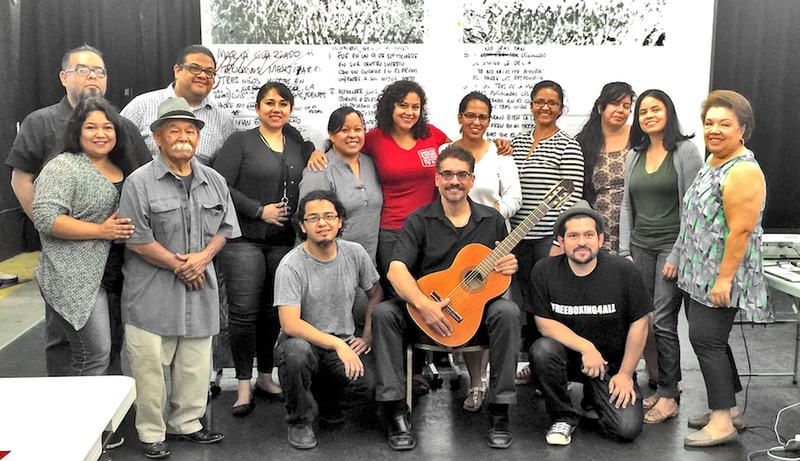 The hands-on “Corridos: Mexican Tragic Ballad Songwriting Workshop” (over 20 workshops nationwide) teaches participants how to pen their own songs and tell their local stories by using this popular Mexican narrative ballad style. In 2015, this program was honored to call U.S. Poet Laureate Juan Felipe Herrera one of its participants. “La Hora del Son” (32 episodes distributed worldwide) is a syndicated radio and podcast show about the music and the musicians who have inspired us that reaches listeners in far away locations through broadcast and online media. Altogether, NEA funding, and also indirect funding through regional agencies like Arts Midwest, the Mid-Atlantic Arts Foundation and the Illinois Arts Council, amounts to more than 15% of our annual budget. Its loss would be devastating. Without it, we would be challenged to reach the tens of thousands of people we have touched with the programs described above. Sones de Mexico not only brings this unique music to stages across the country; it also brings the stories of the people who created it. Our presentations and educational programs for youth bring a deeper appreciation for what the culture and music of Mexico have to offer. This comes at a time when Mexico and people of Mexican descent suffer from increasing stereotyping and discrimination. 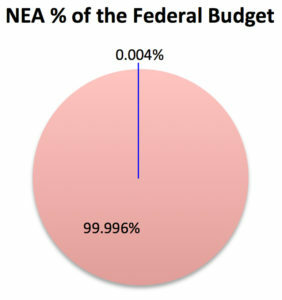 The NEA is often characterized as only benefiting the elites of the art world, but nothing could be further from the truth. 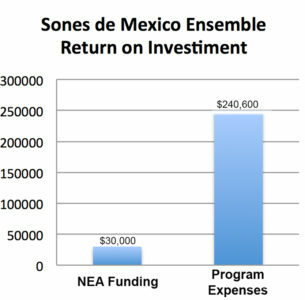 A mandate of Sones de Mexico’s NEA funding is that the programs it supports be made available to the public free of charge. Without the NEA, we will see many arts organizations like museums, orchestras, and public art initiatives downsize, close their doors or completely transform themselves to cater to a free market economy. We urge you to learn more about this issue. The American for the Arts Action Fund has resources to help you do so.